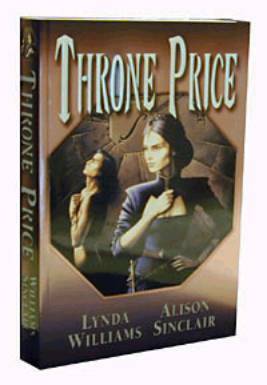 I think it was Alison Sinclair that gave me a copy of Throne Price, but if it was Lynda I do apologize. My first comment about this book was for the beautiful metallic looking cover and cover illustration by artist Sandrine Gestin. When I read the title of the book I remember thinking, “Did they lose an n from that title?” but it is the Throne Price and when you read the novel you will understand. Throne Price is a wonderfully political and yet deeply psychological exploration. On top of that, it is a mystery, or more correctly several mysteries. I admit that in the first chapter I was feeling quite at a loss on how to understand all the names that were thrown at me. I didn’t know who was who. For that matter, I couldn’t tell what was person, planet, race or place. The authors, Lynda Williams and Alison Sinclair, dropped me into a world where everything had been established long before I got there and the future seemed to be as full as the past. I followed the main characters, Erien and Amel, through this world and learned as I went. I was introduced to people as deep and interesting as the world around them. I got lost in the pages and found detail so woven into this tale of tradition and change that I could hardly put the book down. I will not give away parts of this story and ruin your exploration into this novel. I would even suggest that you do not read the back cover. Just pick up the book and explore. Know that while my initial questions were answered by the end of Throne Price, I found that I had many more new questions to ask. I look forward to more books in this universe, and hope that Lynda Williams and Alison Sinclair will continue to share them with us. “Throne Price” by Lynda Williams and Alison Sinclair, has been selected as one of three finalists for the 2004 Benjamin Franklin Awards competition, for best book of the year in the popular fiction category. First Published in Neo-opsis issue 9.